Wednesday morning February 9, 2011, dawned bright and clear, the air crisp as a mint dust jacket. Our first destination was Serendipity Books in Berkeley, Peter B. Howard, proprietor. Why not start out at the top of the book food chain? I had been to Serendipity a number of times, although my last visit had been almost ten years earlier. Most of my visits occurred during my stint from 1995-1997 as director of the book department at the San Francisco auction house of Butterfield & Butterfield. This experience, albeit outdated as to current events, made me the default team leader for the trip. For Douglas Adams, my biblio-cohort, this was his first visit to the Bay Area in search of books. 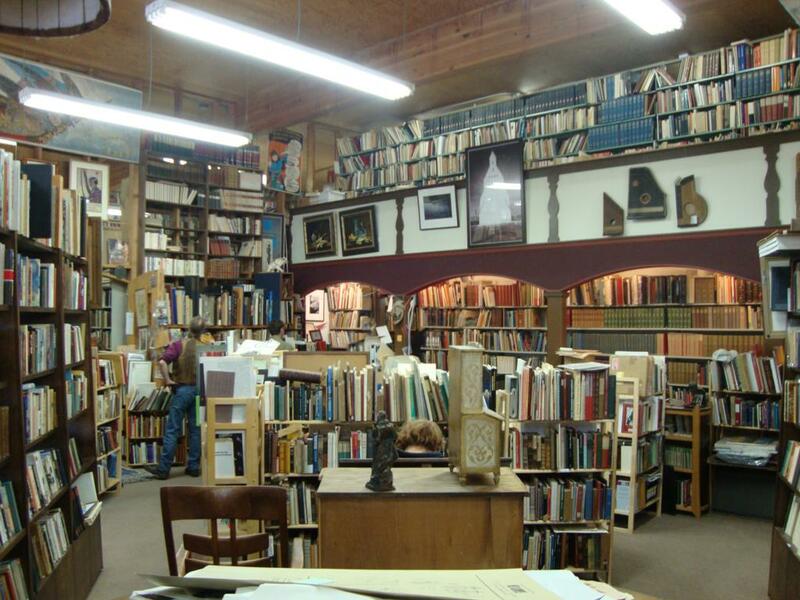 Peter Howard, doyen of literary booksellers on the West Coast, still presided over his shop—if just barely. Terminally ill with pancreatic cancer, he was physically frail but his mind remained sharp. Peter was present when we entered the shop around 9:30 am. The place was crowded. Peter sat just to the right of the entrance in one of the main isles, wearing his beret and loosely fitted plain blue tie and white shirt, comfortable pants and black tennis shoes, holding court with fellow booksellers, collectors and general admirers. His long-time assistant, Nancy Kosenka, was busy doing most of the legwork and invoicing for purchases. Peter’s complex personality was legendary: one minute he could be an irascible s-o-b and the next generous to a fault. He had an opinion on just about everything and wasn’t afraid to let you know it. He wasn’t always right but you wouldn’t want to bet against him. I sensed he used his brash nature, quick wit, and selected standoffishness as a protective buffer. He was a people person but wanted to retain some semblance of privacy and focus—after all, he was busy selling books for a living. I’ve seen little mentioned of his superior salesmanship. He was aggressive and proactive. He could quickly dissect your collecting interests and if he found something for you it was not unusual to receive a personal call offering an irresistible item. The price was usually just high enough to make you hesitate but in the end the book ended up on your shelf—extended payment sometimes dangled to complete the deal. He also was one of the first dealers to pursue and encourage large sales to institutional rare book libraries. 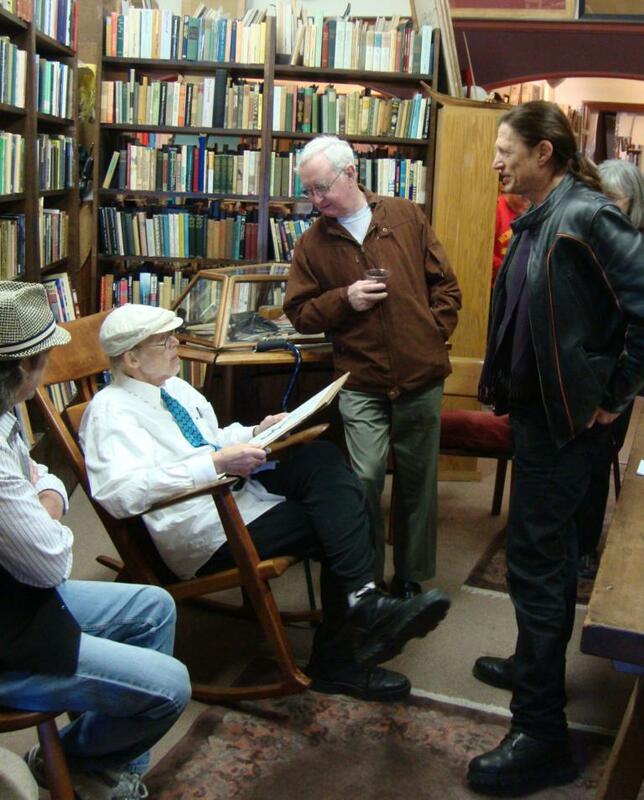 Peter began selling books in the early 1960s after a short stint as a college English professor. His natural acumen as a bookman blossomed and in 1967 he opened his first shop on Shattuck Avenue in Berkeley. He became the foremost leader in selling modern literature and poetry but handled just about all subject areas. Peter had many of the world’s top collectors and universities as clients yet he made time for the impecunious enthusiast, the budding dealer, or the serious scholar in need of a book. He also apprenticed a number of now prominent bookmen in the trade. 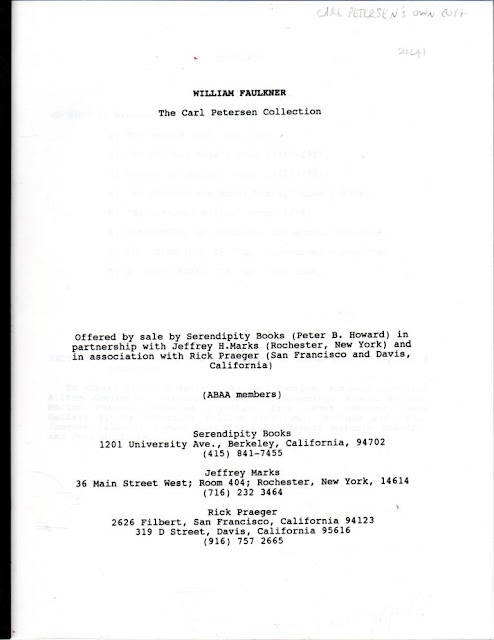 One of his most well-known catalogues is the Carl Petersen collection of William Faulkner issued in 1991. It basically serves as a bibliography of the writer. Peter bought the extensive collection in partnership with Jeffrey Marks and Rick Praeger. Peter organized and catalogued the material. It was a massive task, 642 pages in final form. I spoke to him about experience years ago and he inscribed in my personal copy of the catalogue, “For Kurt, 1000 of my hours here just imposing order.” I’m also fortunate to own Carl Petersen’s own typescript proof of the catalogue with correspondence laid in. Petersen was a highly skilled collector and had strong opinions about cataloging his books. His good suggestions and feedback on the catalogue are intermixed with nitpicking and obstinate ideas. Peter appears to have handled all with aplomb. However, I’d liked to have been a fly on the wall behind the scenes! 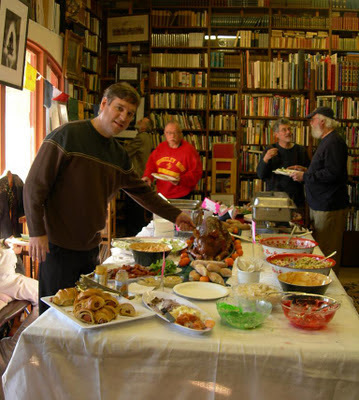 The reason for our large morning congregation at Serendipity Books was the all day “Thirteenth Biennial” Open House and Buffet served courtesy of Peter. 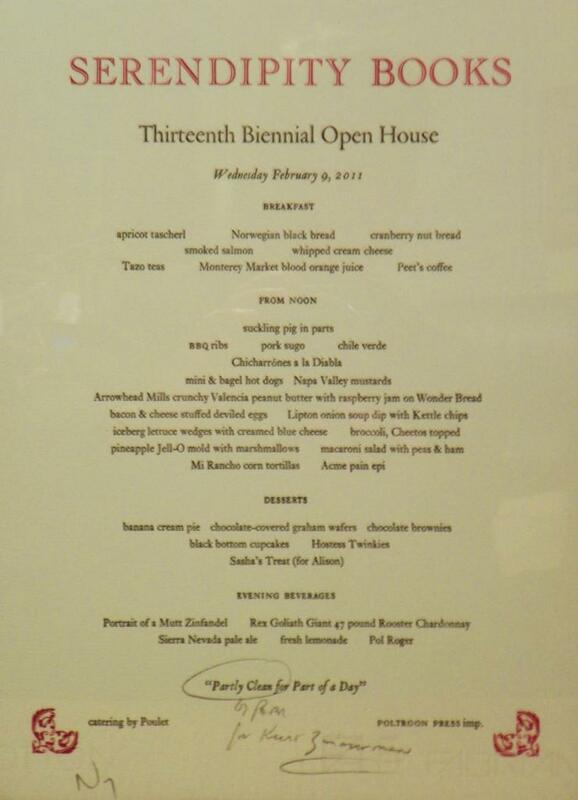 This food fest was held to coincide with the San Francisco ABAA Book Fair that week. It had become a tradition put on for the visiting ABAA booksellers and the rest of us bookmen looking for a good meal, fine conversation, and rare books. A nicely printed broadside menu spelled out the offerings. I hold one before me now. And of course, we were all there for the books. The store, located at 1201 University Ave, Berkeley, since 1986 was deceptively large and every nook and cranny was crammed with tomes. The rough estimate was a few hundred thousand books. (This does not include a separate storage warehouse.) Shelves stretched to the top of high ceilings, boxes of new arrivals lined passageways, and there was a second floor stuffed to capacity. Most impressive were the parts of the store with compact shelving on metal rails that allowed for even more storage space. A turn of a wheel moved massive shelves along the rail and opened access isles for patrons. The whole system was very expensive and normally only seen in libraries with specialized storage concerns. It could also be dangerously exciting as book hunting goes. I experienced this first-hand as I browsed the extensive bibliography section. The section was located in compact shelving near the rear of the store. I turned one of the big wheels to move shelves and open up a passage to examine the books. I was happy as a proverbial book clam until the shelves started to close around me. Images of the Star Wars garbage compactor scene flashed into my mind. I let out an urgent shout, then another. The shelves stopped compressing me and a woman from the catering staff stuck her head in from around the corner. “Sorry, didn’t know you were back there. We just need some space at this end to get by.” Despite the risk of life, I finished browsing the area and dug out a few minor items that I wanted. The store was almost perfectly disorganized. General sections of literature, history, mystery, Americana, etc. were accessible and easily browsed, but vast areas were filled with pockets of similar material just arrived or moved or being re-organized. This greatly increased the fun of the hunt. Also, Peter had no qualms about putting pricier books on the shelf with the general stock. Speaking of prices, much of the general stock reflected pre-internet pricing and was frankly too high for the current market. However, this was remedied by significant discounts upon purchase ranging roughly from 20 to 50% off. Nancy managed the discounts on already priced material but deferred to Peter on un-priced items. I’m not sure if this liberal pricing policy was normally in effect but it generated significant dealing and sales on Open House day. My best find there was not a book but a dust jacket sans tome. The Serendipity flat files were also a treasure trove filled with miscellaneous broadsides, posters, maps, and some stray dust jackets. After a little digging, I pulled out the substantially intact jacket of Zora Neale Hurston’s Mules and Men (1935). The jacket and book were illustrated by Miguel Covarrubias, noted Mexican artist and caricaturist, whom I collect. A nice copy of the book in jacket is a $2,000 + item with the jacket being about 80% of the value. Such a purchase would greatly exceed my Covarrubias budget—an eagerly collected area for me but only a sideline collection. There was no penciled price on the stray jacket. Peter Howard serendipitously passed by a few moments later. He was in a hurry but he paused for a moment when I hesitantly asked the price. “What do you want it for?” he replied gruffly. He eased a bit and nodded. “You can have it for $150,” and he was gone before I could thank him. Such are some of the moments that were common at Peter’s store and seldom encountered elsewhere. He cracked a thin smile and we spoke a bit more. I asked him to inscribe my ABAA book fair directory. He liked that. The directory listed Nancy Kosenka in charge. (When the directory was printed, it had been highly probable Peter wouldn’t be alive when the show began, or at least couldn’t attend.) But you can’t hold a dedicated book person down. Peter mustered one last burst of energy to be there. Peter returned to his home that evening. According to the papers, he never left again, and died on March 31 while watching his beloved San Francisco Giants on television. The store stayed opened a couple more months then closed its doors. The stock is to be sold by Bonhams in a series of upcoming auctions. RIP mighty bookman! Peter B. Howard (1938-2011). http://stevenfama.blogspot.com/2011/04/peter-howard-requiescat-in-pace.html A fine tribute by a collector who knew Howard well. Also recently published: Stephen J. Gertz, editor. A Wake for the Still Alive: Peter B. Howard. Los Angeles: Booktryst, August 2010. Wrappers. 200 copies. Contains brief reminiscences of Peter by prominent dealers and collectors. I visited Serendipity regularly, starting a few years before the move to University Avenue. The one time that I really got to talk to Peter -- essentially for an entire afternoon -- was when I noticed a run of interesting Kit Morley material on a shelf. I happened to be friends with the two main Morley collectors,one of whom was no longer very active at the time, and asked Peter if he had quoted the items to the other Morley-ite. The fact that I knew this person apparently made Peter feel that I was worthy of having a conversation, and we talked about Morley, A. Edward Newton, a collecting passion of mine, and book collecting/selling in general...literally for hours. It's a great loss to the community.